Go to the 2012 updated version of these reviews here. ArcSoft have gone the longest way since last year's Blu-ray player reviews with their TotalMedia Theatre. For whatever reason they have skipped version 4 and the current version is numbered 5. Maybe that's their way of pointing to the large amount of new features. ArcSoft have dispensed with the multiple editions (there used to be Standard, Gold and Platinum editions of TMT) and there appears to be a single edition of TotalMedia Theatre 5. Which is a good thing, I guess. So, what's new in this version of ArcSoft's Windows Blu-ray player software? First and foremost, 3D support that used to be available for TMT 3 through a plug-in (and for OEM licensing only) is now improved and integrated in TotalMedia Theatre 5. The Sim3d engine which is responsible for transforming 2D material (not only movies, but also photos) into 3D has been updated. Added is support for additional file formats (WTV, FLAC and more) which now brings TotalMedia Theatre in the league of PowerDVD 10 and near the abilities of dedicated video file players. Another move in this direction is the improved subtitles support: manual subtitles selection (unlike PowerDVD 10, which only has automatic subtitles and they need to match the video filename), and a cool new feature, which allows for What-You-See-Is-What-You-Get subtitle positioning. The SimHD engine which is ArcSoft's equivalent of Cyberlink's TrueTheater HD (or with other words ArcSoft's upscaling and post-processing engine) has been updated with a few post-processing effects, namely noise reduction and smoothness. Apparently, ArcSoft have been taking notes of Cyberlink's foray into the online world. So they now have an online venture of their own, albeit in a slightly different direction. They have practically added a simple YouTube video browser and player in TotalMedia Theatre. 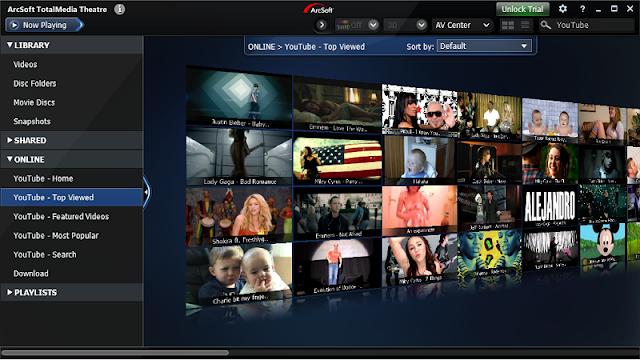 It allows you to search for particular videos and navigate the Most Popular and Featured channels. You can also connect to your Facebook profile and post status updates linking the currently playing YouTube video. The user interface of ArcSoft's Windows Blu-ray player software has been updated. It now feels slicker and more minimalistic, but also more streamlined. A new feature called Magic View (see the screenshot) allows browsing all the video lists through an interactive grid of thumbnails. This view is applicable to all video lists: YouTube, UPnP media servers, the library, any user created playlists. Videos can be previewed directly on the grid. Pretty neat, and also optional: you can switch back to good old lists if this is too extravagant for you. There is also an all-new Smart Menu feature, which simulates the pop-up menu of Blu-ray movies for video files and DVDs. That's where the user can search IMDB for movie info or add bookmarks to scenes in addition to the typical audio, subtitles and chapters options. The user interface improvements also spread over the Windows Media Center integration. It is seamless and feature rich. Last, but not least, ArcSoft have probably done some optimizations in the playback engine. The player is now faster as can be seen in the comparison table at the end of our Blu-ray player reviews. Noteworthy features coming from TotalMedia Theatre 3 include Parental Control options, Power Management profiles and the ability to bookmark scenes in videos. And there is still HD DVD support, which might tip the scales towards TotalMedia Theatre 5 if you happen to own HD DVDs from the days of the HD format wars. Another unique feature is BDMV support or, in other words, the ability to play Blu-ray content from folders. This is a handy feature for people who like to store multiple Blu-ray discs on hard drives for backup or easier access. Performing a similar feat with PowerDVD 10 would require manually selecting and playing the .M2TS files forming the BD structure. One minor gripe I have concerning ArcSoft's Blu-ray player software is the fact Windows needs a reboot in order to complete the installation. Now, this is obviously only done once and is very minor but is still something that belongs to the past and a nuisance you don't experience with neither PowerDVD, nor WinDVD. Check the following link to see if there is a valid TMT 5 coupon code currently. Our Windows Blu-ray player reviews continue with Corel's, Roxio's and Nero's Blu-ray player software.